Another good weekends work on the car with an added bonus of a trip to see the guys at Mustang Maniac on Saturday. After looking around the cars again I can see the KR replica is looking like a serious motor now, and I love the lights at the rear, in fact I want it! I believe they will be posting the updates for that soon. I have seen a sneak preview of the new website which is almost ready for launch and it looks pretty damn good I must say. It will be a huge leap forward for them as the parts ordering will become automated with online ordering with photo’s and stock availability etc. You won’t even have to call them to order the parts, just checkout, pay and wait for the order to turn up. It was great to see the guys again and have a laugh in the boys club. After speaking to Adam about my car and what to do next, I was advised to get the rear loom out and all the “shiny bits” from the dash. So I did. First job was to take out the heater controls and the non-original cigarette lighter that had been fitted. The fact I had to be double jointed to get to the two nuts holding the heater control face plate in place didn’t help. More thought was required and produced the solution by removing the ashtray mounting, then trying again made life so much easier. Next up was to get the heater matrix and motor and pulled out through the firewall. The only tricky part was going to be making sure the pipes didn’t leak any water onto the inside and make everything sticky as antifreeze tends to do. The whole process was simple enough and no spillage I’m glad to say. Once the motor and matrix was out-of-the-way the next job was the rust treatment which was going to be a pain, just because of the places I had to get to now that I could get to due to the clear space. Two brushes were used, sorry, destroyed during the process, one softer for all the curves and tight places, the other harder brush for the larger areas that were visited later after I got my head out of the way. A few missed patches from an earlier attempt were spotted and were linked up so all the surfaces are now treated. The ultimate position should be entered into the yoga handbook for men. In order to do it was on my back with my head jammed up against the cowl, with the centre tunnel under an arm pit, not ideal but my long arms helped. Note to self – next time I must tape a thick cloth to the top of the shifter as I managed to draw a little blood on the back of my leg as a result of a sharp plastic fitting that has the skin shredding capability of a golden eagle talons. In fact if I Pulled myself right up, I could look out of glove box. I tried to take a selfie but my arms just weren’t quite long enough, shame though. Removing the loose rust and all the dust produced a couple of nice surprises as I was brushing it all out clean. But more of that in a bit. The idea was to paint right up inside the dash into all the nooks and crevasses that I could get a paint brush into and work down towards me. For once I wore some safety goggles in order to stop any splash backs of the anti-rust liquid getting in my eyes. I looked like I had just borrowed Buddy Holly’s specs as they are a bit old, but do the job. However, I needn’t of worried as none splashed on me for a change. But of course, if I hadn’t of had the safety glasses on, the brush stroke would have flicked the lot in my eyes, with a handful of rust dust to make it worse – guarantee it! The pictures here are quite unique as they are inside the dash looking towards the truck, I personally haven’t found many of these on-line to be fair so I thought I would share them, just in case anybody is interested. I mentioned earlier that I got a little surprise as I was brushing the dust and rust out. Well, this key fell out and landed on the floor pan. I have compared it to the other keys that I have and I looks like a single sided ignition key. As there was no ignition tumbler in the car when I got it I don’t have an original key to compare it too. 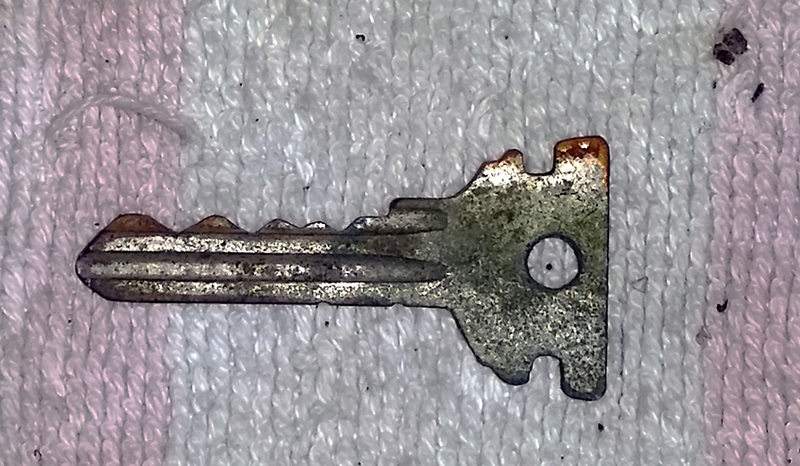 The ignition key I have now is almost the same from the shoulder of the key to the tip of the key. The shape at the top is a little odd though and doesn’t look like the standard keys I have seen. Can anybody give me an idea of what it is or what it would have looked like? Strange place to find it on the back of the dash where the gauges would have been. Or is it not even a Mustang key, I don’t know. I also found a Dime as well which I think the date says 1964 or 1984 I can’t quite tell. This entry was posted in Car, Photo's and tagged brushes, Buddy Holly, chrome, dash, Dime, heater matrix, keys, Mustang, rust, safety. Bookmark the permalink. If it’s not the key for the car then there is a great story there somewhere! That was my thoughts, how on earth did it get there? I would love to know. If only keys could talk! I’m impressed with what you’re doing. When I say I “fixed up” my Mustang, I bought her new floormats and took her to the car doctor, where she stayed for a week for cosmetic work that made her sleek and shiny again. Presented with the project you’re undertaking, I’d fold and give up. (Much like I did with the 1971 camper I tried to restore.) I commend you and I’m excited to see your progress! Hi Rachel, the project is a lot bigger than I expected in respect if all the smaller fiddly bits that nobody sees at the end of the day. I genuinely enjoy doing what I do but can be frustrating at times. I have some friends at Mustang Maniac who help me out when I need advice. I did like the comment about the mats though, sometimes I wish mine was that simple. Do you still wish you had the camper van now though? if you ever need more safety goggles let me know. We sell them and I could get you some no problem. Thanks I will keep it in mind, out of interest how much for a light weight pair? Always wear goggles! You never know what little mishap might take place. Then you’d be in the house recuperating instead of tinkering in the man cave. The stuff in my eyes did worry me as I was upside down wedged under a dash, it would have taken me a while to get to some water to rinse it out. The damage could be done, so glasses it was. I tend to wear them when grinding or drilling etc. I couldn’t cope with not being able to be in my man cave I must say. Hi Dana, I have been found out I need glasses, preferably not ones like my safety glasses, it was probably a washer of some sort and not a dime after all. Lol.